We have about 40 trolleybuses at the museum premises at any one time from around 60 in the collection. From time to time, the trolleybuses on site are rotated with others we have in store elsewhere, and sometimes we have trolleybuses visiting us from other museums. 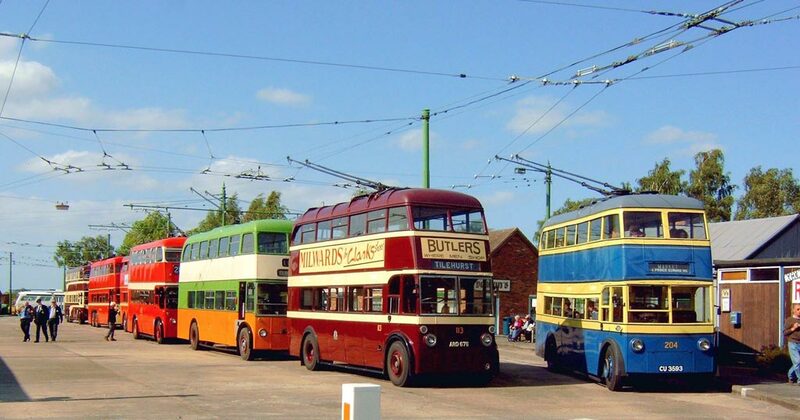 Depending on what the theme might be for different open days, as well as the trolleybuses that are being used in service to give rides to visitors, other selected trolleybuses (and motor buses) may be on display in the open air. On some days, we may also stage photographic opportunities with line-ups of particular vehicles (a commentary and description of the vehicles involved may be given), and sometimes, short periods of continuous running of trolleybuses and buses are staged to add atmosphere to our displays and satisfy video photographers. Certain open days also feature twilight and after-dark trolleybus operation. Many trolleybuses remain in our depot building, and can be viewed by visitors, but room between vehicles in the depot is very restricted and may not allow wheelchair access. On most open days we provide a guide to take groups of interested visitors around the trolleybuses in the depot and on display. For safety reasons, visitors are not permitted to enter any drivers’ cabs and not permitted to board vehicles inside the depot without invitation.